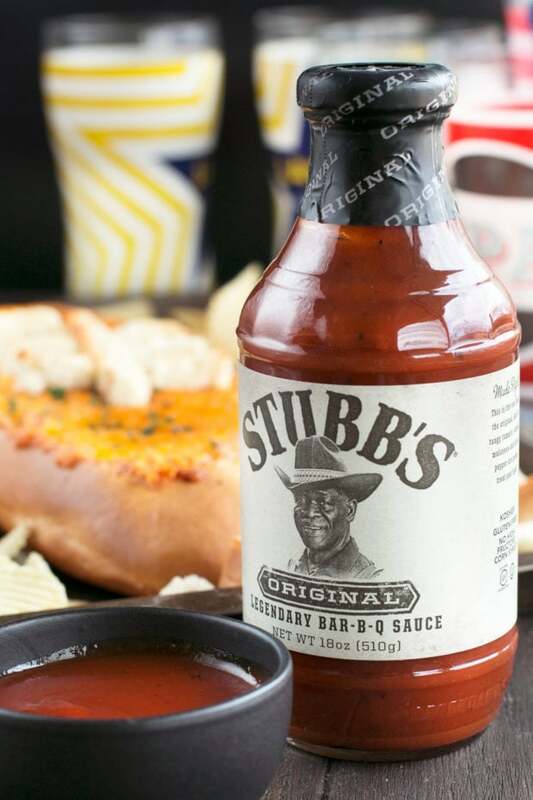 Disclosure: This post is sponsored by Stubb’s Legendary Bar-B-Q Sauce. The contributor was compensated for recipe development. All opinions are her own. 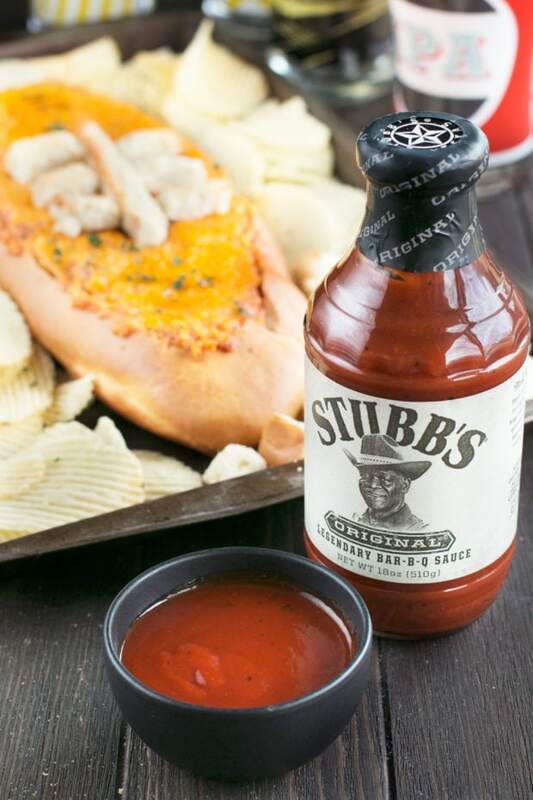 Featuring Stubb’s famous Original Sauce with all of its incredible flavor, this meaty BBQ dip is the real deal. 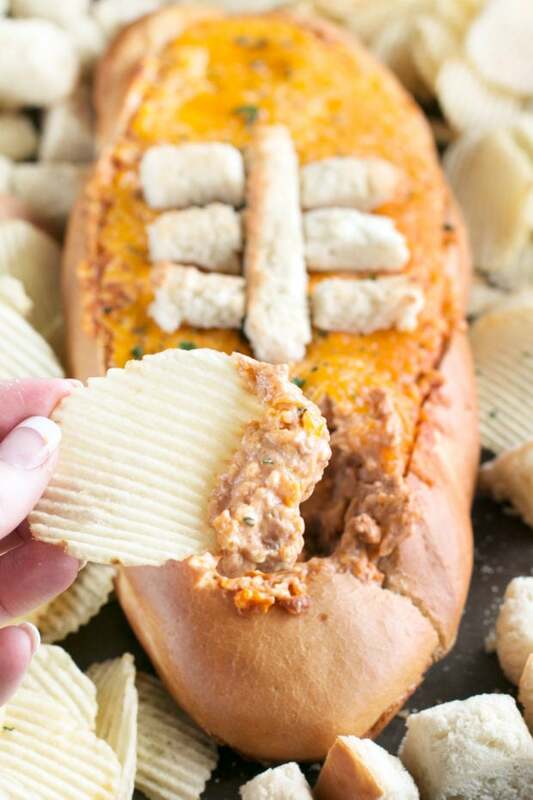 Made to look like a football, it’s impossible not to get in the tailgating mood! You all know that I love any excuse to tailgate. Whether my favorite team is playing (despite their terrible losing streak right now) or I’m rooting for the Man’s favorite team, tailgating is in my blood. It’s probably because any food associated with tailgating is the bomb dot COM. We usually see all of our tailgating favs pop up in September and October, but how can the fun stop there when there’s still weeks of football before that final big game?! 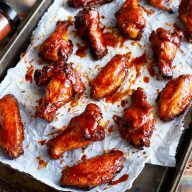 I’m here to help you stuff your guts during the holiday season with yet another excuse to eat more – extreme tailgating! When Stubb’s Legendary Bar-B-Q asked me to create a recipe for extreme tailgating, I was alllllll about it. I mean, with all of their sauces, rubs and marinades that feature bold flavors you can’t get anywhere else, how could you possibly resist? 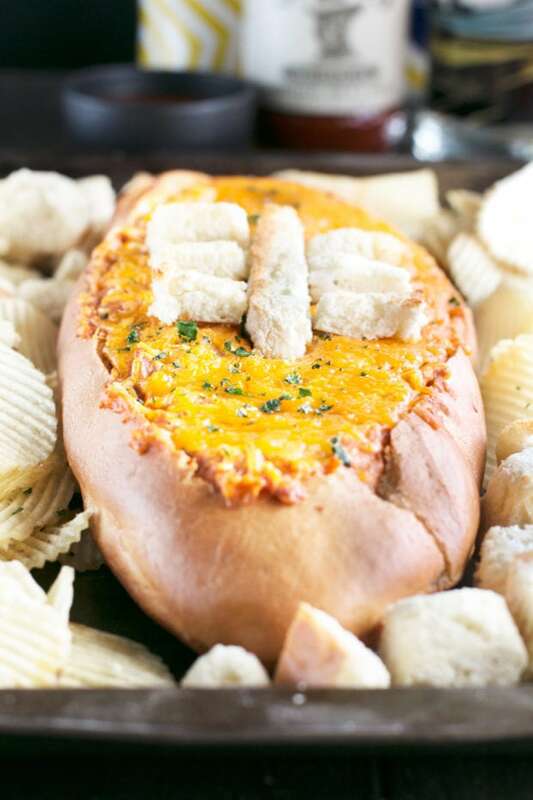 The main star of this cheesy, meaty, and ridiculously flavorful bread dip is Stubb’s Original Sauce. Let me just start by telling you this sauce is the REAL DEAL. Stubb’s Legendary Bar-B-Q is keeping the magic alive with all of their flavorful sauces, rubs and marinades. 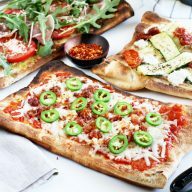 With ingredients like tomatoes, peppers, spices and molasses that never include high fructose corn syrup and are gluten free, you are guaranteed to enjoy any food that you add their products to. A dip like this is SO ridiculously easy and takes little to no effort to pull together. Yes, even the cute little laces on top are easy to make and make the whole dip super festive for every Sunday game. 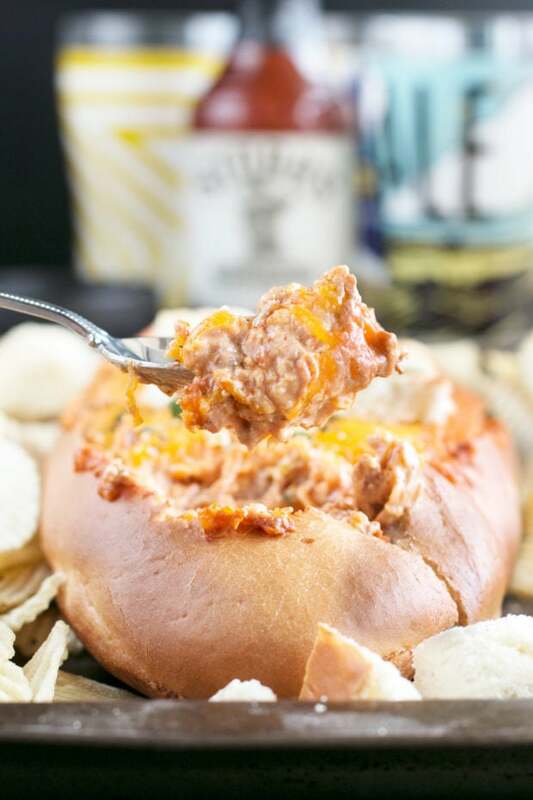 The BBQ sauce brings the cheese and meat together in a sultry, savory dip that is impossible not to devour. 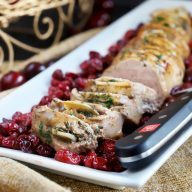 It’s tangy and rich with just the tiniest bit of sweetness to balance out the bold flavors. 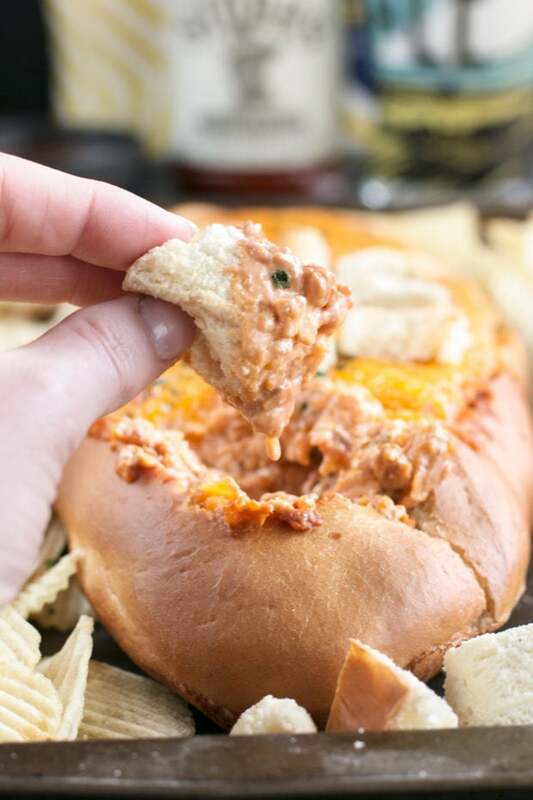 When you serve it up with toasted bread cubes and chips, you’ve hit the jackpot of tailgating dips. 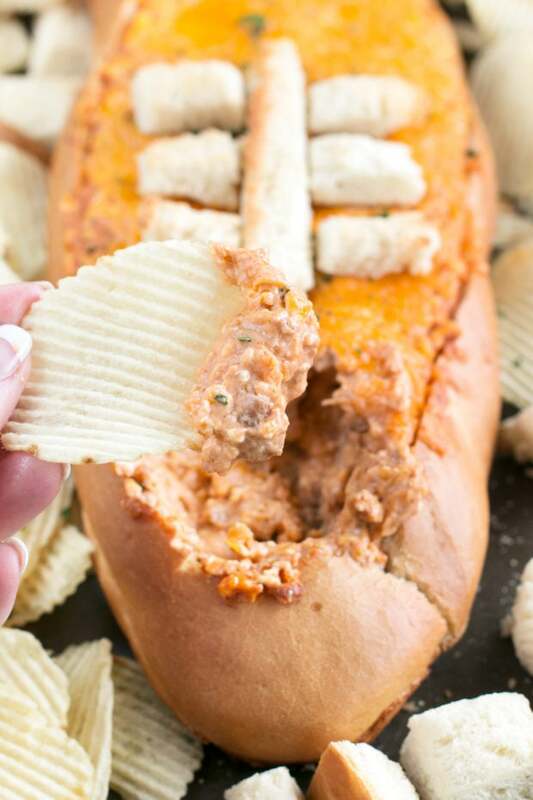 Pin this Cheesy Pulled Pork BBQ Bread Dip recipe for later!